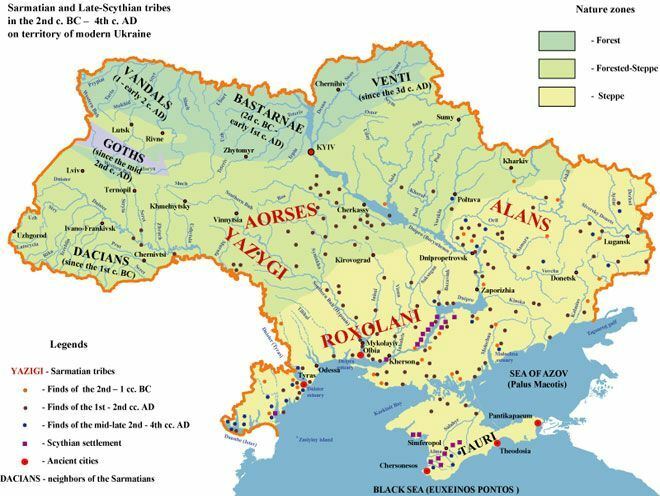 Sarmatia was an ancient region in what constitutes modern Ukraine except Crimea (which was known as Taurica). It was dominated by the Sarmatians, a large Iranian confederation that existed in classical antiquity, flourishing from about the 5th century BC to the 4th century AD. In the 4th and 5th centuries, the Huns expanded and conquered both the Sarmatians and the Germanic Tribes living between the Black Sea and the borders of the Roman Empire. From bases in modern-day Hungary, the Huns ruled the entire former Sarmatian territory.